The descriptions and other reviews are spot on. Nikos and his mother Maria provide a personal touch welcoming you to their luxury home and it's simply splendid. I'm always a bit skeptical staying at private homes as people all have different standards - but Palazzo Zante was built with full attention to the details. It's literally impeccably clean, the materials are all first class (from the mammoth stones, to iron doors, to window construction the air conditioners in each bedroom worked simply & flawlessly, the pool and jacuzzi and no slip tile surface, the amazing outdoor seating area with superb shade - and the list goes on.) We took pictures of various things that gave us ideas of things we'd like to do with our own back yard when we return home. The home is a 10 minute drive from downtown Zante. It's simple. Be sure to rent a car because driving around the island is part of the joy and overall experience. Google Maps makes it simple. Nikos will also share with you the team at Isala Travel - they are the perfect complement to this luxury home as Isala will help with private boat tours, restaurant recommendations and such. Our visit to Zakynthos was our first time in Greece - and we choose this island because of the Palazzo Zante home - and we are entirely satisfied with our decision. Great example of an entrepreneur in Nikos positively impacting his local economy by creating such a welcoming destination. (Prior to staying here our family was in San Sebastian, Spain and stayed at the 5 star Maria Cristina hotel. Staying here at Palazzo Zante was the perfect complement to that - still 5 star accommodations but now our own private home, with pool, outdoor BBQ, a nice yard where we could play frisbee and spike ball, and an opportunity to cook one or two nights as a family - while always having the island at our fingertips to explore.). Thanks Nikos, Maria and Noella for a wonderful experience! All the best to you! This is such an impressive and unique accommodation to call home in Zakynthos. It's just like staying in your own castle! Maria was so welcoming, helpful and obliging as the host. We were treated to a home cooked hot apple pie on arrival then to a delicious traditional Greek meal of pastitsio served with Greek salad for our following nights dinner. Everything about this place is simply amazing, from the decor, to the scenery and to the pool and BBQ facilities set within the villa's expansive grounds. As a group of six Aussie travellers, we had the most wonderful and memorable stay here. Having our own van we were able to drive to local shopping facilities and to a variety of scenic locations like beautiful Shipwreck Beach. Very highly recommend this accommodation experience!! We were a group of 6 travelling around Greece for 4 weeks and staying at Palazzo Di P was a highlight for us. We had seen photos but it was jaw dropping beautiful to see it for the first time! Although we only had 2 nights, we settled in with the help of our friendly host, Maria, who showed us each room. There were drinks in the fridge and wine on the table. Maria went above and beyond to ensure that our stay was memorable. She cooked us a delicious traditional Greek dinner the second night which was greatly appreciated by us as we didn't have to think about what to buy. We didn't even have to clean the dishes! Thank you Nikos and Maria for a truly memorable experience! We stayed at palazzo di P in August and had a brilliant holiday. The villa itself is very beautiful with all the space and facilities you could possibly need. There are loads of seats and loungers around the pool, and a huge outdoor dining table. There's also a nice bbq area and pizza oven outside so you've got everything you could possibly want for luxurious outdoor holiday living. The owner Nikos and his family are incredibly friendly and welcoming and even cooked us a feast of Greek food one day. A maid comes every morning and cleans the whole property from top to bottom so you don't have to lift a finger. Faultless. We're 8 people, ages 12 to 62, in zakintos for 4 nights. 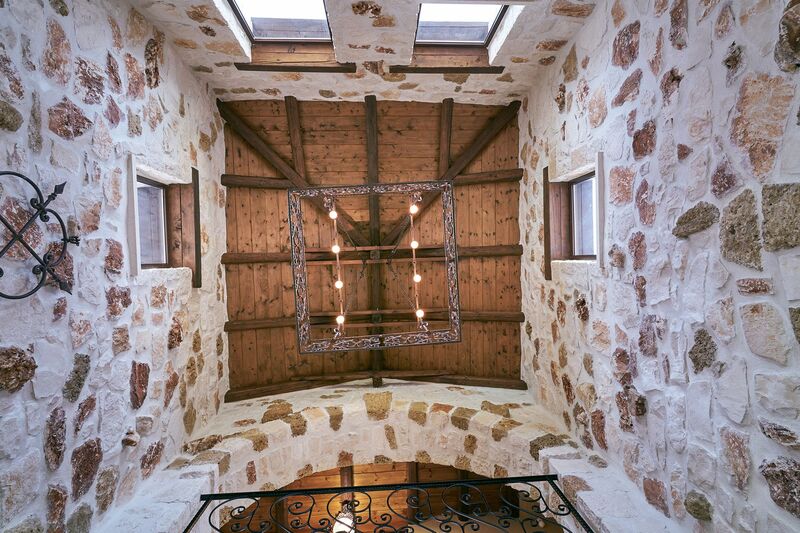 We cannot express our gratitude enough, of the villa - of this castle, located in the mountains. We have to start the hospitality and loving embrace of our hostess Maria, a home owner, travel guide and a booking agent all at ones. THANK YOU . This villa is excellent. It is aesthetically-pleasing being built with the use of local stone, has a beautifully appointed interior, with amazing views from the upper floors (and some fab balconies), and the grounds are spacious and superbly maintained. We enjoyed the pool of course, but also the extensive shaded soft-seating area, with the separate and very well-appointed barbecue - this really is a 5 star Villa. What makes the Villa 5 star plus in our opinion (and relative to hiring Villas/Apartments) over the last 20 years, is the welcome we received from Nikos and his mother Maria - exceptional. All of my pre-arrival dealings with Nikos had been straightforward and executed with charm and integrity. His mother Maria exuded warmth at our arrival and made us feel immediately relaxed. We were shown around the villa - which has a real "wow" factor - and then found a welcome meal in our fridge, prepared by Maria - Greek home-cooking really is something to relish. Add to this the daily servicing of the villa by friendly and discrete housekeepers, Maria being nearby for any issues, and you have a recipe for relaxation and fun. The Villa is 10minutes drive from Laganas and, at the same time, a world away. It is idyllically set amongst a few other residences and so many Olive Trees. The noises you will hear are the crickets, the goats, the dogs, the occasional tractor, and Owls - memorable moment when late one evening, the Owl glided across the lit-pool to perch on the barbecue roof - awe-inspiring. I jogged 15mins (it is 30-35mins to walk) to the baker, butcher, and fruit stall, all on the main road - they were all good particularly the butchers souvlakia/skewers. I would recommend a car because this is an island worth exploring - we went up to the North (Ag St Nick) and it was a scenic (if slow) drive, also to Keri Beach (lovely and where we hired a 6 person boat for 2 hours), to Grampas Winery at Lagopodo where we enjoyed the "Tasting Tour" immensely - all the wines were Good !!! We drove over to the Keri Lighthouse and sat at the drinks shack enjoying a Mythos and the blue blue blue sea views. Also drove to Banana Beach nr Vassilikos for comfy beds and great food at the beach restaurant. We used SEACRET beach bar at Tsilivi which had a car park, good beds, and food and drink services that were reasonably priced. All in all a fabulous Villa and a great holiday was had by all, parents, grandparents and 4 teenagers. We will be back. The House is absolutely amazing. It is comfortable, clean and quiet. We had two wonderful weeks at Palazzo di p.
So yesterday I return home from another incredible stay at the palazzo di p. It's been 2 years since my last stay and there have been lots of changes the pool area has had a total revamp it's looks fantastic the new floors and fencing around the pool to the lovely draps in the seating area it all look stunning.. Love the new furniture in my favourite bedroom the house it's just spectacular. It has everything and more you could ever need... I would like to say a big thank you to nikolaos Paleothodoros and maria palaiothodoros for our wonderful welcome your hospitality is second to none. We all had a wonderful holiday hope to see you again soon .